If you have ever received a blood transfusion, along with the red blood cells, leukocytes, plasma and other components, you also were infused with a collection of viruses. A recent study of the blood virome of over 8,000 healthy individuals revealed 19 different DNA viruses in 42% of the subjects. Viral DNA sequences were identified among the genome sequences of 8,240 individuals that were determined from blood. Of the 1 petabyte (1 million gigabytes) of sequence data that were generated, about 5% did not correspond to human DNA. Within this fraction, sequences of 94 different viruses were identified. Nineteen of these were human viruses. The method is not expected to reveal RNA viruses except retroviruses which are integrated as DNA copies in the host chromosomes. The most common human viruses identified were herpesviruses, including cytomegalovirus, Epstein-Barr virus, herpes simplex virus, and human herpesvirus 7 and 8, found in 14-20% of individuals. Anelloviruses, small viruses with a circular genome, were found in 9% of the samples. Other viruses found in less than 1% of the samples included papillomaviruses, parvoviruses, polyomavirus, adenovirus, human immunodeficiency virus and human T-lymphotropic virus (the latter two integrated into the host DNA). The other 75 viruses are likely contaminants from laboratory reagents or from the environment. These include sequences from non-human retroviruses, four different giant DNA viruses, and a virus of bees, all found in less than 10 samples. These findings illustrate the challenge in distinguishing bona fide human viruses from contaminants. Identifying viruses in blood is an important objective for ensuring the safety of the blood supply. Donor blood is currently screened for HIV-1 and 2, human T-lymphotropic virus-1 and 2, hepatitis C virus, hepatitis B virus, West Nile virus, and Zika virus. These viruses are pathogenic for humans and can be transmitted via the blood. Some viruses, such as anelloviruses and pegiviruses, are in most donated blood, yet their pathogenic potential is unknown. It is not feasible to reject donor blood that contains any type of viral nucleic acid – if we did, we would not have a blood supply. Continuing studies of the blood virome are needed to define which viruses should be tested for in donated blood. The human papillomavirus (17 people), Merkel cell polyomavirus (49 people), HHV8 (3 people) and adenovirus (9 people) detected in this study could be transmitted in the blood and their presence should be monitored in future studies. It’s important to emphasize that this work describes only viral DNA sequences, not infectious viruses. 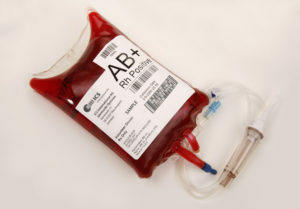 The blood supply is screened by nucleic acid tests, but it is important to determine if infectious virus is also present. If viral DNA is present in blood but infectious virus is never found, then it might not be necessary to reject blood based on the presence of certain sequences. Does anyone know if the DNA sequenced was cell-associated DNA only (as opposed to DNA free in plasma)? I can’t tell from the methods section of the PLoS article, but I’m guessing that since the original goal was to sequence human genomes, this result represents only cell-associated viruses. If that is the case, the blood virome is probably considerably larger. My guess is that it is cell associated DNA (inside the cells or stuck to them). I agree that the blood virome is probably larger – other studies suggest that. I have an email in to Eric Delwart who can hopefully provide more information. The methods section is very thin on how the DNA was prepared – not good! Science papers are supposed to enable you to repeat the results. Thanks! I’m happy that the human virome is getting attention. Not because I want people to be overly concerned, but because I’ve been interested for a long time in the potential for virus-virus interactions. I think you’ve posted in the past about co-infections that affect viral pathogenicity in unpredictable ways. When we work with viruses in tissue culture or animal models we strive for “clean” systems, for good reasons, but I think we may be missing potentially useful tools for fighting disease that this paper shows are floating in our blood. Previous post: An open letter to Psychological Medicine, again!